Food Smart is the smartest way to shop! We are a cost plus supermarket and provide you with a whole new way to save on groceries. This is not a limited assortment store. We offer the best quality National Brand products along with our stores brands, Best Choice and Always Save. We also have the freshest meat and produce you can find. We buy Smart deals so you can save and be a Smart shopper! Quality food does not have to cost you more at Food Smart! Every item is priced at our cost to get the product from the source to the shelf, then we add just 10% at the checkout. The result is the guaranteed overall lowest prices around and there are no membership fees or loyalty cards to keep up with. You just come in, shop, and save! 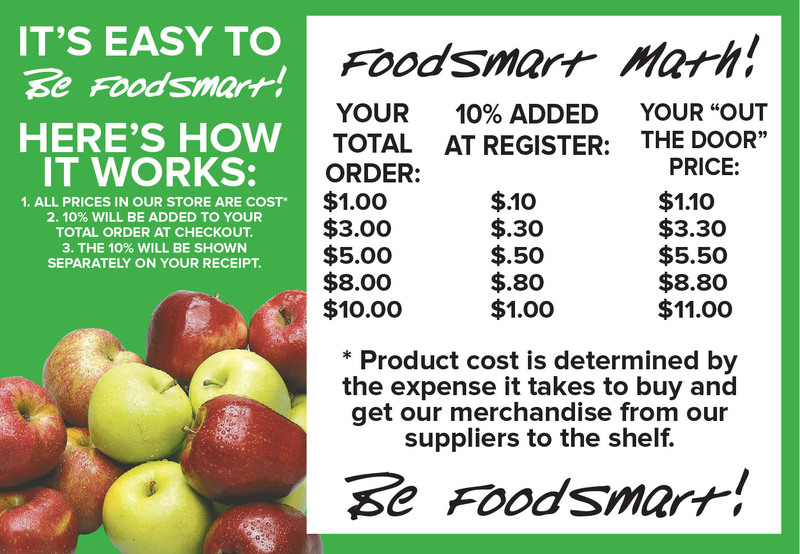 Be a SMART shopper and save money at FOOD SMART! 1.Do you like to purchase high quality foods? 2.Do you like to save money on your weekly grocery bill? 3.Do you shop at Food Smart? If you answered YES to all three of the above questions, you are a GENIUS!